My neighbour and I regular meet at our wall and catch up on each others news. 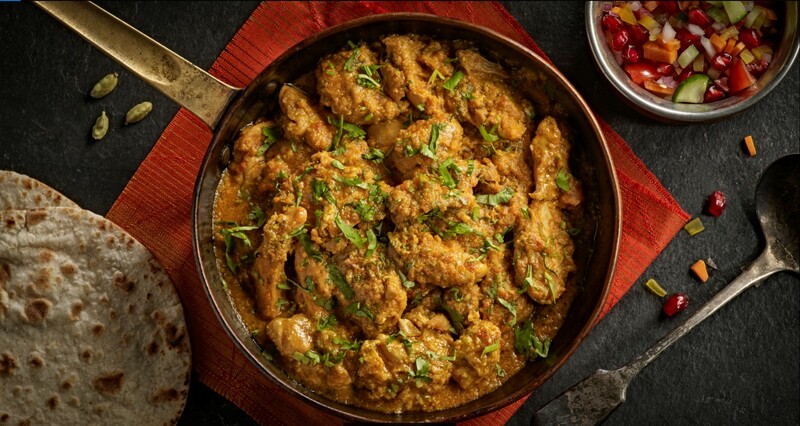 She loves curry and wanted to introduce Indian spices to her children. I was asked to develop a chicken dish that would appeal to her children. she wanted great flavour, a little heat and a creamy texture. I set about developing a recipe using local rapeseed oil, grinding my own garam masala blend and yoghurt instead of cream and butter. this lighter alternative was hit with the children and has appealed to those who enjoy a creamy curry. It is perfect dish to be eaten with a tasty naan, salad and cumin spiced rice. "A great aroma and a homecooked look. Generous pieces of chicken. All individual ingredients and spicing well distinguished. The chicken is moist and well seasoned with gradually building heat. We all went back for seconds"
Ingredients free range chicken, Onions, Ginger, garlic, chillies, yoghurt, almonds, tomatoes, rapeseed oil, salt, mixed blend of spices, coriander.